Lots of random illegitimate kids are left out of this. Seriously. This is just Apollo’s illegitimate kids (immortal and mortal.) Ready to make your head hurt? Look at this family tree. I’m thinking someone’s lying about being related to gods. What do you think? Yes. 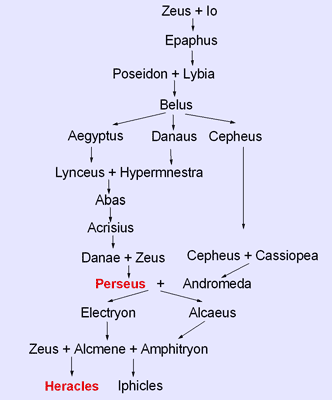 Zeus shows up in Heracles family tree three times. Yes. Zeus is messed up. Most of those people aren’t important except for Perseus and Andromeda and Zeus and Io, who is the chick that Zeus tries to conceal from his wife by turning her into a cow, but Hera figures it out and sends a horsefly to sting her. Io runs across the Mediterranean to Egypt where she becomes the goddess Isis. Perseus is that guy from Clash of the Titans, the guy who slayed Medusa and rescued Andromeda from a sea monster. So yes, Admetus and Alcestis are half-cousins. The Egyptians were doing a lot worse in this period.